Telescope encoders took an -- almost literally -- quantum leap when they went from optical disks full of stripes to magnetic strips read by a pickup head like in magnetic tape recorders. 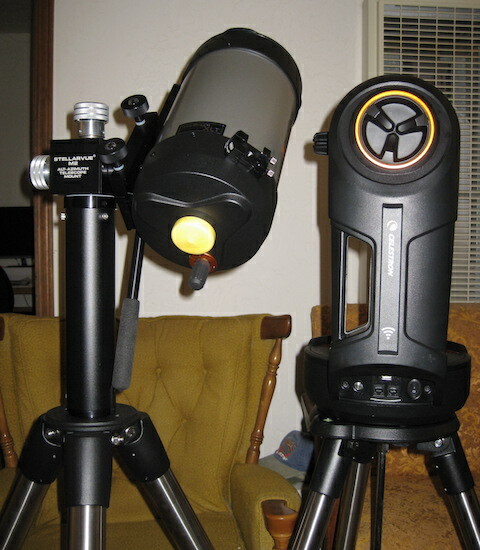 The Celestron mount on the right has optical encoders. 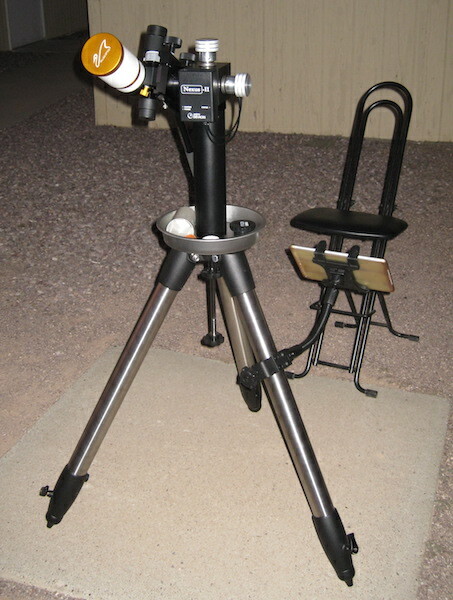 The little square Stellarvue M2 box mount on the left got an upgrade. 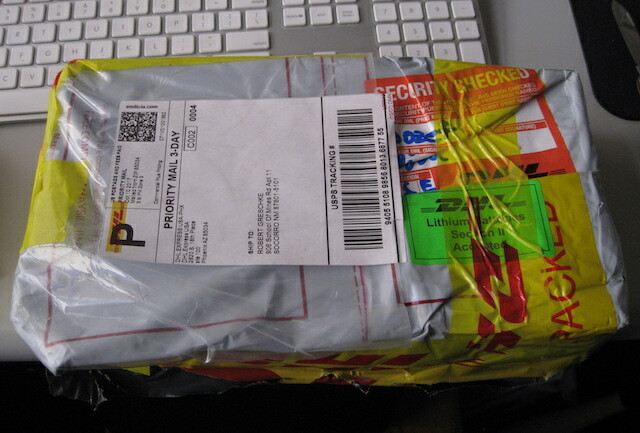 I don't get them often, but packages from Australia always have something good in them. Stolen from the AstroDevices site. 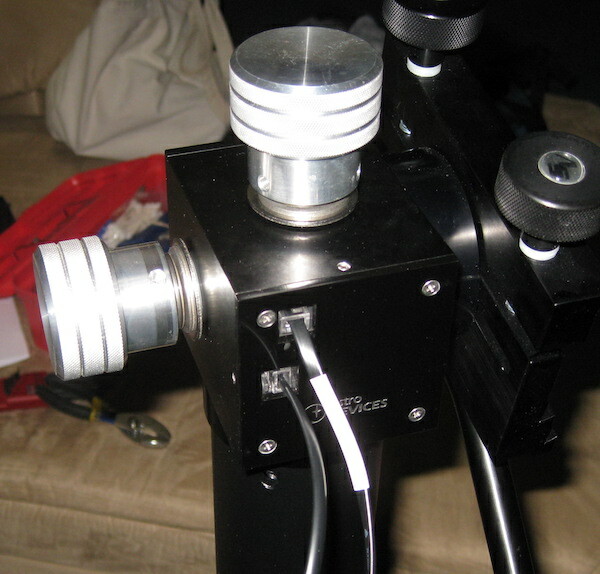 The encoder kit from AstroDevices for the M2 mount is pretty straightforward. It comes with all the parts and most of the tools you need to get it all going. 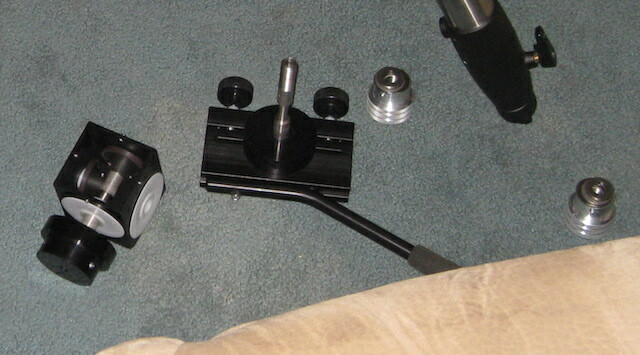 The two wheels are the parts that move with the motion of the mount, and the square cover has the pickup heads to sense the "ticks" going by when the mount is moved. 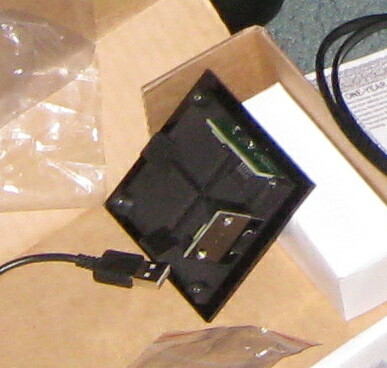 It replaces the one of the metal sides of the mount's cube. When you unscrew the two friction/tension adjustment knobs from the mount the whole thing just pulls apart. The only thing you have to watch is the order and direction of all of the washers between the knob and the cube to get it all back together the right way. 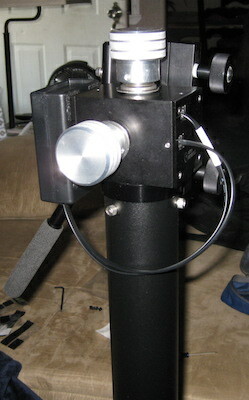 The two wheels slide on to the azimuth and elevation shafts as you put the mount back together. Mine were a little hard to slide on, but that's OK. They're not going to be doing anything like slipping on me. A set screw further keeps each wheel from slipping. When I put the cover with the read heads on the cube the heads where not quite in the right place and they crashed (in computer hard disk terms) into the edge of one or both wheels -- there was a bit of scraping when the mount was moved. I took the cover back off, loosened the two screws that hold each PC board with the electronics and the head just a bit, stuck a piece of business card to each wheel where the head was going to be and installed the cover. The thickness of the business card set the position of each head just above the magnetic edge of each wheel. 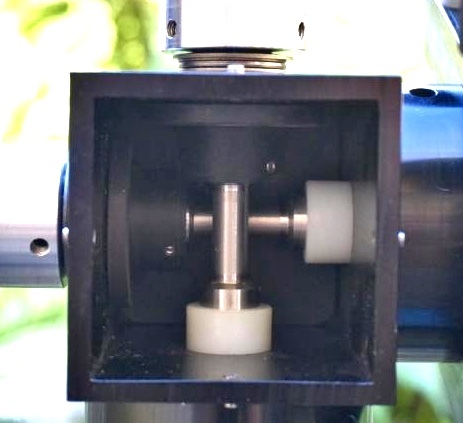 The distance of the heads from the wheels can be up to .5mm. I took the cover off, tightened the screws for the PC boards, removed the business card pieces and reattached the cover. Perfect. You can see the PC board screws in the parts picture near the top. The holes the screws go through are slots for just this kind of adjustment. The two coily cables in the parts picture do not actually come with the kit. The supplied cables are just regualr flat ones. You let Serge know how long you want them to be when you order. I told him to make them a foot long. They could have been just a couple inces longer. It's farther from the front of the cube to the back of the cube than I thought it was, but they worked anyway. There wasn't going to be any relative movement between the encoder plate and the unit the encoders would plug into, so I was able to just make them a fixed length. Bing, bang, boom! 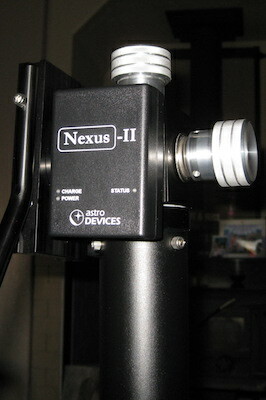 The cables have to connect to something, so I got a new Nexus II something at the same time to connect them to. With the internal battery in this unit there are no other wires to deal with. 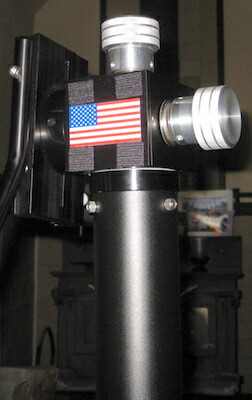 The US flag covers a LARGE font "MADE IN USA" ingraving, and the Nexus II covers the flag. It's unavoidable. There were only two sides on the mount that didn't have holes or knobs, and now the encoder plate made one go away. Four squares of Velcro did the trick. Ready for action. With 311,000 steps the cursor glided across the SkySafari map on my iPad. The $0.88 cake pan from Walmart made a nice tray for stuff. The handle on the M2 mount just misses it. I didn't have the leg spreader installed this outing. Just didn't need it. Now that I look at it a heftier cake pan may work well as a spreader too. Hmmm.